As aforementioned, I live across the street from the Villa Doria Pamphili, the largest public park in Rome. On days like today it’s a joy and a pleasure to be so close to hills, dales, lakes, forests and fields. And Vivi Bistrot makes it even better. When I first started frequenting Doria Pamphili a decade or so ago, the spot was occupied by a bog standard bar made interesting only by the fact that it was located smack dab in the middle of the park. 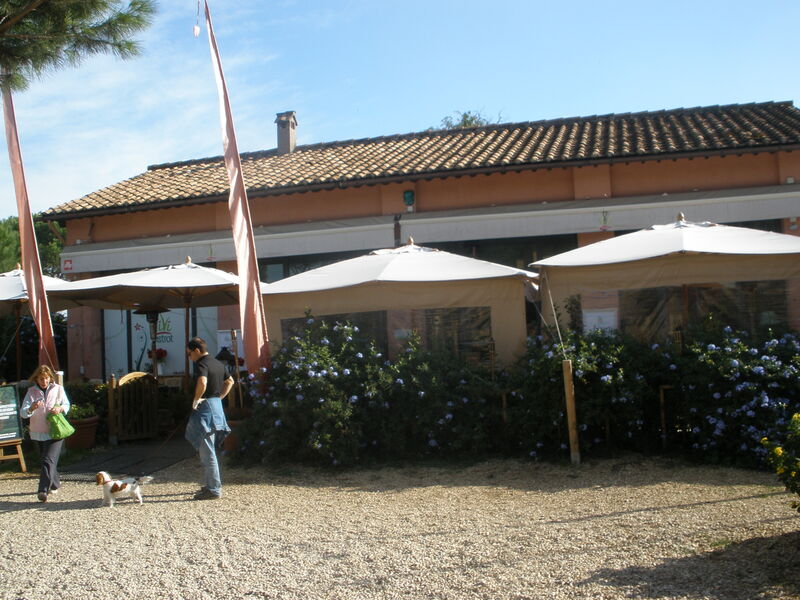 Then, a few years ago, Daniela Gazzini and Cristina Cattaneo, two “Mommy/entrepreneurs” according to the website, established Vivi Bistrot, “a place with a feminine touch, inspired by Provence” (the website again). It’s a lovely spot. The food is simple–mostly sandwiches and salads–and all organic. You can eat in the pretty restaurant or buy a picnic and enjoy it in the park. During the winter Vivi Bistrot is open for dinner on Fridays and Saturdays only. It gets very crowded during the day so it makes sense to book in advance. I like to go there in the morning for a cappuccino and apple crumble. Totally yum. Free WiFi and dog friendly. What’s not to like? Enter the park at Via Vitellia 102 (at the corner of Via Leone XIII). For reservations call 065827540. The Villa Doria Pamphili is the largest landscaped public park in Rome. It was acquired by the Pamphili family (which gave us Pope Innocent X) in the 17th Century and when the family line died out in the 18th century, it passed to Prince Giovanni Andrea IV Doria. The park has gardens, theatres, forests, fountains, streams and a lake. I spend hours there every day. It is fantastically wonderful. And the best thing about Villa Pamphili is the dog park. 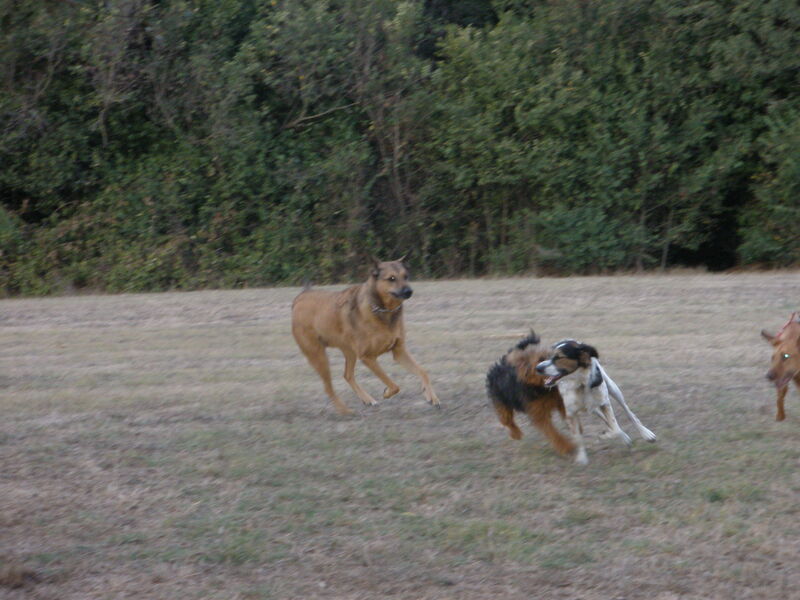 Morgan and some friends at Villa Doria Pamphili (he's the little black and tan terrier). A number of years ago, a group of concerned citizens/dog owners petitioned the City of Rome for some space in the Villa where dogs could run free (elsewhere they have to be on leashes although nobody pays much attention to that). The result was the dog park: an acre or so of hillside, conveniently located across the street from my house. At any given time, there are 10-20 dogs out there racing around, barking and generally causing mayhem while the owners calmly stand around discussing 1). their dogs 2). food 3). soccer. This is in stark contrast to non-dog owning Italians who spend their time discussing 1). food 2). soccer. Because we see each other everyday, we’ve developed into quite a little community (although oddly, we tend to address each other by our dog’s names rather than by our own, i.e. Mamma di Lula, Papa di Aldo). 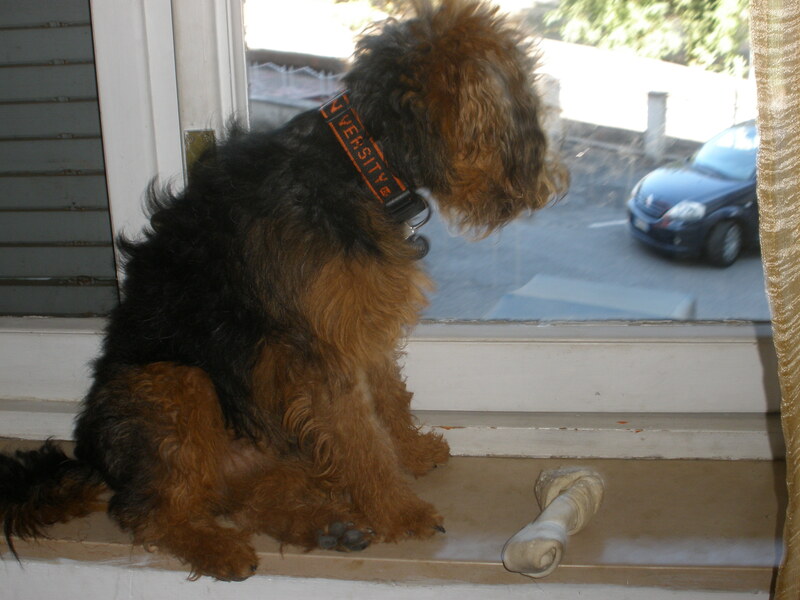 When he’s not out playing, Morgan (my 9 month old Welsh Terrier) sits at the window looking at the dog park and whimpering when he sees his friends. Possibly you need to be a dog person to find this all as fun and adorable as I do. But hey, if you’re not a dog person, you’re probably on the wrong blog.